The FireArrow’s Advanced Stock Quote Web Part provides a rich and customizable stock tracking experience for users in SharePoint sites. It offers several elegant display styles with flexible configurations to define the stock list you would like to display. 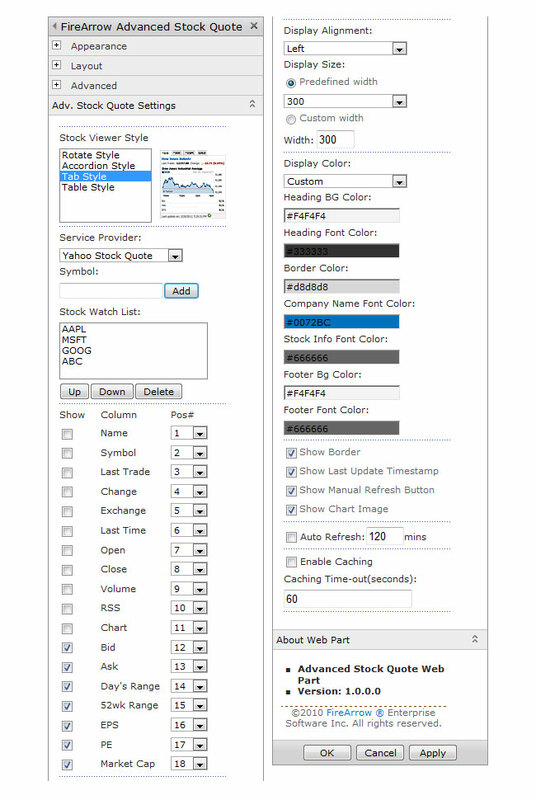 It allows you to pick and choose exactly what information you want to display, as simple as just current stock quote price to detail trade information, including historical charts. 03/27/2018Release 1.20.32.16, replaced google with the new service provider. Please use yahoo symbol instead of google symbol. 01/18/2018Release 1.18.12.16, fixed the mutual fund symbol issue. 11/29/2017Release 1.16.37.18, fixed issues caused by the new service provider. 11/09/2017Release 1.15.18.26, switched to a new service provider. Please use google symbols instead of Yahoo symbols, the currency and some indexes are not available. 10/27/2017Release 1.11.6.26, minor update on the service provider. 10/14/2017Release 1.11.6.15, fixed INDU(.DJI) issue. 06/18/2017Release 1.10.08.12, fixed the chart issue. 11/07/2016Release 1.9.28.16, added 2016 support. 08/27/2014Release 1.7.8.18, enhanced the fail-over capability. 03/30/2014Release 1.6.9.14, added the service timout setting. 11/06/2013Release 1.5.14.18, fixed the issue caused by iGoogle close down. 07/17/2013Release 1.5.8.16, enhanced the ssl support. 05/30/2013Release 1.4.2.16, enhanced navigation for tag and accordion styles. 01/27/2013Release 1.3.38.6, added 2013 support. 01/10/2013Release 1.2.22.15, fixed the ^IXIC update issue caused by the Yahoo service. 08/26/2012Release 1.2.18.6, improved the fault tolerance. 04/23/2012Release 1.2.17.15, fixed the datetime display issue caused by recent sp2010 patchs. 12/28/2011Release 1.2.15.8, improved the compatibility,added SSL support and solved the INDU issue. 08/03/2011Release 1.0.1.5, fixed some issues. Please feel free to contact us to let us know your thought about our software and any additional features you would like us to offer. This field is required. The max length of comment is 3000 characters. Please enter the correct verify code or get a new code. Copyright © 2007-2018 FireArrow® Software Inc. All right reserved. To download the file, you must agree to the following license. End User License Agreement (EULA) READ CAREFULLY AND UNDERSTAND ALL OF THE RIGHTS AND RESTRICTIONS DESCRIBED IN THIS AGREEMENT BEFORE INSTALLING OR USING THE SOFTWARE THAT ACCOMPANIES THIS EULA (“SOFTWARE”). BY THE ACTION TO INDICATE YOUR ACCEPTANCE OR USING THE SOFTWARE, YOU AGREE TO BE BOUND BY THE TERMS AND CONDITIONS OF THIS AGREEMENT. IF YOU DO NOT AGREE TO THE FOLLOWING TERMS AND CONDITIONS OF THIS AGREEMENT, DO NOT USE THE SOFTWARE. NO REFUND WILL BE MADE BECAUSE THE SOFTWARE WAS PROVIDED TO YOU AT NO CHARGE. This is a legal agreement ("Agreement") between you and FireArrow Enterprise Software Inc ("FireArrow"). This EULA governs your use of FireArrow's software programs which include the associated media, any printed materials, and any "online" or electronic documentation. The terms also apply to any FireArrow’s updates, supplements, internet-based services and support services 1.Grant of License FireArrow grants licensee a personal, non-transferable (except as expressly provided in Section 5 below) and non-exclusive right to use and execute the SOFTWARE on a single computer, Under no circumstance may you store, use or allow the use of the SOFTWARE in any manner on more than one computer at a time. You agree that you will not sublicense, rent, or lease any portion of the Software; reverse engineer, decompile, disassemble, modify, translate, make any attempt to discover the source code of the Software, or create derivative works based on the Software. You may make one copy of the Software solely for a back-up purpose. 2.Copyright The Software is licensed, not sold. You acknowledge that no title to the intellectual property in the Software is transferred to you. You further acknowledge that title and full ownership rights to the Software will remain the exclusive property of FireArrow and/or its suppliers, and you will not acquire any rights to the Software, except as expressly set forth above. All copies of the Software will contain the same proprietary notices as contained in or on the Software. All title and copyrights in and to the SOFTWARE PRODUCT (including but not limited to any images, photographs, animations, video, audio, music, and text incorporated into the SOFTWARE PRODUCT), the accompanying printed materials, and any copies of the SOFTWARE PRODUCT, are owned by FireArrow or its suppliers. The SOFTWARE PRODUCT is protected by copyright laws and international treaty provisions. You may not copy the printed materials accompanying the SOFTWARE PRODUCT. 3.Reverse Engineering You agree that you will not attempt, and if you are a corporation, you will use your best efforts to prevent your employees and contractors from attempting to reverse compile, modify, translate or disassemble the Software in whole or in part. Any failure to comply with the above or any other terms and conditions contained herein will result in the automatic termination of this license and the reversion of the rights granted hereunder to FireArrow. 4.Export Restriction You agree that the Software will not be shipped, transferred or exported into any country or used in any manner prohibited by the United States Export Administration Act or any other export laws, restrictions or regulations. 5.Transfer Restrictions You may transfer all your rights to use the Software and Documentation to another person or legal entity provided you transfer this Agreement, the Software and Documentation, including all copies, update and prior versions to such person or entity and that you retain no copies, including copies stored on computer. Except as provided in this Section, you may not sublicense, transfer or assign this Agreement or any of your rights or obligations under this agreement, in whole or in part. 6.Upgrades If the SOFTWARE is an upgrade from an earlier release or previously released version, you now may use that upgraded product only in accordance with this EULA. If the SOFTWARE PRODUCT is an upgrade of a software program which you licensed as a single product, the SOFTWARE PRODUCT may be used only as part of that single product package and may not be separated for use on more than one computer. 7.Disclaimer of Warranty The Software is provided "AS IS" without warranty of any kind. FireArrow and its suppliers disclaim and make no express or implied warranties and specifically disclaim the warranties of merchantability, fitness for a particular purpose and non-infringement of third-party rights. The entire risk as to the quality and performance of the Software is with you. Neither FireArrow nor its suppliers’ warrant that the functions contained in the Software will meet your requirements or that the operation of the Software will be uninterrupted or error-free. No oral or written information or advice given by Licensor or its dealers, distributors, employees or agents shall in any way extend, modify or add to the foregoing warranty statement regarding no warranty be given to End-User. FireArrow IS NOT OBLIGATED TO PROVIDE ANY UPDATES TO THE SOFTWARE. 8.Limitation of Liability FireArrow's entire liability and your exclusive remedy under this EULA shall not exceed the price paid for the Software, if any. In no event shall FireArrow or its suppliers be liable to you for any consequential, special, incidental or indirect damages of any kind arising out of the use or inability to use the software, even if FireArrow or its supplier has been advised of the possibility of such damages, or any claim by a third party. 9.No Liability for Consequential Damages In no event shall FireArrow or its suppliers be liable for any damages whatsoever (including, without limitation, incidental, direct, indirect special and consequential damages, damages for loss of business profits, business interruption, loss of business information, or other pecuniary loss) arising out of the use or inability to use this FireArrow product, even if FireArrow has been advised of the possibility of such damages. Because some states/countries do not allow the exclusion or limitation of liability for consequential or incidental damages, the above limitation may not apply to you. 10.Term and Termination This license agreement takes effect upon your use of the software and remains effective until terminated. You may terminate it at any time by destroying all copies of the Software and Documentation in your possession. It will also automatically terminate if you fail to comply with any term or condition of this license agreement. You agree on termination of this license to either return to us or destroy all copies of the Software and Documentation in your possession. 11.Governing Law This Agreement shall be construed and enforced according to the laws of the State of Georgia (United States of America) and any dispute under this Agreement must be brought in this venue and no other. 12.Indemnification If you distribute the Software in violation of this Agreement, you agree to indemnify, hold harmless and defend FireArrow and its suppliers from and against any claims or lawsuits, including attorney's fees that arise or result from the use or distribution of the Software in violation of this Agreement. 13.No Waiver The waiver or failure of either party to exercise in any respect any right provided in this agreement shall not be deemed a waiver of any other right or remedy to which the party may be entitled. 14.Severability If any term of this Agreement is held by a court of competent jurisdiction to be invalid or unenforceable, then this Agreement, including all of the remaining terms, will remain in full force and effect as if such invalid or unenforceable term had never been included.